This pack contains 5 OneSize Pocket Nappies. This is our perfectly engineered OneSize pocket nappy from LittleLamb. They now come with two of our famous bamboo boosters per nappy as the previous microfibre boosters were prone to compression leaks. The length of the rise has also been increased in line with customer recommendations. The cover is made from s-t-r-e-t-c-h-y knit and coupled with a clever snap configuration you can alter the size and fit as baby grows. The pocket on the inside of the nappy lets you slide in the absorbent bamboo boosters prior to fitting onto baby. Pocket nappies were developed from the all-in-one style - where the layered absorber was sewn inside - but they took an age to dry. The soft lining that sits next to baby’s skin is a super-soft microfleece that draws away moisture to the bamboo boosters, protecting baby’s skin. WIth pocket nappies the most important thing is to get the boosting right for your baby's need, a light wetter may only need one booster, most will need two and possibly three for overnight. 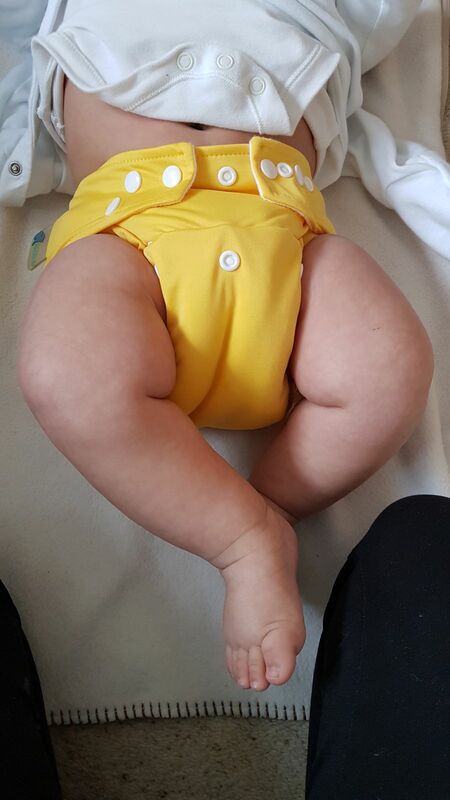 Noemi H. Reviewed by Noemi H.
I can't find any fault with these nappies. I'm very happy with them so far. Alannah O. Reviewed by Alannah O. Loved this nappy for my chunky thighed baby fits really well and keeps her dry for a long time! Amy H. Reviewed by Amy H.
I bought some of these as I needed a slim nappy for my baby once he started to sit up. These are so comfy on him and don't dig into his tummy like some other brands I have. They wash well and dry really quickly. Michelle N. Reviewed by Michelle N.
Have tried lots of different types of cloth nappies. Would highly recommend these ones. I cannot recommend Little Lamb one size pockets highly enough, they are so good! I have been using them for around 9 months now and they are so reliable. The stretchiness means I always get a good fit on my son, and the bamboo boosters are very absorbent. For the price (especially when on sale!) they really can’t be beaten.